This year, D.O. La Mancha wineries have been taking great strides to become the first thought for Spanish Wine in the United States. Since May, the D.O. La Mancha has launched a very ambitious promotional campaign in different cities of China and the United States. 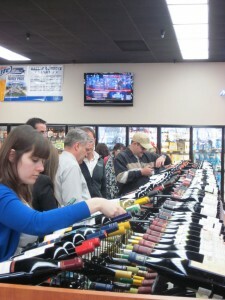 In May, wineries traveled throughout America to show the media and trade their wine. The delegation included D.O. officials and 11 wineries from the provinces of Albacete, Ciudad Real, Cuenca and Toledo. Attendees at the Dallas event. They held their second leg of the so-called Road Show in October, showcasing 13 wineries for trade and media, including Southern Wine & Spirits, Total Wine, Whole Foods, Glazer’s and BevMo. Sommelier and filmmaker Charlie Arturaola also spoke about his connection to the wine region. In Los Angeles and Dallas, important industry decision makers enjoyed with the wine traditional La Mancha dishes, including the cochinillo (whole roasted suckling pig), lamb skewers and Manchego cheese. So far, the events have been a major hit. Some media comments. Los Galanes 2010 Arien, Vinos Coloman Besana Real Young Rose of Tempranillo and Casa Gualda with their Seleccion Cincuenta Aniversario.